Chapters 7-8 of Perspectives on Family Ministry is dedicated to family based ministry. The advocate for the position is Brandon Shields, who, at the time his chapter was completed, oversaw high school and collegiate ministries at Highview Baptist Church, a large multi-site church here in the metro Louisville area. Brandon served in youth ministry for 10 years, and he has now take a position as a senior pastor in a Florida church. It is interesting that this is my first post on family based ministry, because I resonate with it a great deal. Two key books for the movement are Family Based Youth Ministry by Mark DeVries (Inter-Varsity Press, 2004), and Think Orange by Reggie Joiner (David C. Cook, 2009). Both of these books are worthy of their own book club installments in the near future. Two Core Values: Shields begins his chapter by underlining two core values that under gird the family based philosophy: flexibility and balance (sounds a little Zen to me but I guess it works). Flexibility is core because every church culture is different. And balance is key because , while encouraging the discipleship efforts of intact families is important, most youth and children today do not enjoy the luxury of an intact Christian family. “Family-based ministry supports Christian families where they exist while, at the same time, aggressively and intentionally engaging non-Christian families with the transforming message of Jesus Christ” (98). Another way of describing these two core values is to say that family based ministry recognizes that the church today must consider its culture missionally, and that it keeps the gospel message as the main thing (”the priority of evangelism ought to shape ministry practice,” 1 Cor 9:22-23, page 114). Family-Based Programming: Family-based ministry does not require a transformation in programming, but rather a fresh mindset–that parents and families are crucial to faith development in every area of a ministry’s program. DeVries says it this way, “Family-based youth ministry is not about what the programming looks like. It’s about what you use the programming for. We try to point as much of our programming as possible in the direction of giving kids and adults excuses to interact together” (quoted on page 99). Family-based churches maintain age graded and often gender specific ministry programs, but intentionally include inter-generational and family-focused events in each ministry–with the goal of providing a platform for families to catch a vision for discipling their own children and teens. Taking on Detractors: Shields insists that age-segregation is not the problem in modern student ministry, and he makes a strong case that research into age-organized ministry has been improperly conducted and used. For example, he insists that the “infamous evangelical dropout statistic” is based more in youth ministers’ recollection and poorly done survey work than in actual reality. He argues, ” Even if a large number of students are dropping out of church after high school, this does not necessarily mean that age-organized ministry is the culprit or that any certain form of family ministry represents the solution” (105). Statistics actually change when considering churches where the youth pastor has a longer tenure (greater than 5 years), the church holds evangelical theological beliefs, and it engages in systematic discipleship. He concludes, ” Age-organized ministry is not the sole or primary cause of post-graduation drop-out rates” (105). A better assessment of age-organized ministry is to see it as a missiological opportunity. “At their best, age-organized programs function as vital missiological tools to touch the hearts of lost students who would not otherwise have a chance to respond in faith to the gospel” (107). Keeping the Gospel the Main Thing: As I noted at the beginning of this review, Shields maintains that the “priority of evangelism ought to shape ministry practice.” Family-based ministers recognize that there is a sub-culture of teenagers, and this movement reaches to minister to the teenage sub-culture as a missionary would reach any ‘foreign’ culture. “Age-organized family-based ministry exists as a tool to address cultural ills in relevant and practical ways” (114). “Family-based churches are acutely aware of the prevailing youth culture and of the breakdown of the nuclear family. Such churches see these trends as strategic opportunities for pursuing the Great Commission in the context of age-organized youth and children’s ministries” (116). Critique: There is much that I resonate with in Shileds’ gospel-centered and contextual focus. The one critique that does hold is a question asked by Jay Strother (see last installment) in his response, “Does family-based ministry go far enough, in actual practice, in addressing the disconnect between the church and family?” What do you think? Can a church reach out misionally (as its primary duty) and equip families in the process? Tim Chester and Steve Timmis. Total Church: A Radical Reshaping Around Gospel and Community. Wheaton, IL: Re:Lit/Crossway, 2008. 224pp. $15.99. Tim Chester and Steve Timmis believe that the gospel is a word that works. And this word works in church community. They state clearly in the introduction to Total Church that these two principles, gospel and community, must shape the way we "do church" (15). Conservatives worry that the emerging church is soft on truth, too influenced by postmodernism. The emerging church accuses traditional churches of being too institutional, too program-oriented, often loveless and sometimes harsh (16). The result of this dual critique is a volume dedicated to understanding how both the truth of the gospel and the life of church community intersect in all of ministry--and all of life. Total Church has two major sections: (1) Gospel and Community in Principle, Chapters 1-2, and (2) Gospel and Community in Practice, Chapters 3-13. Part 1, Gospel and Community in Principle. Christianity is word-centered because God rules through his gospel word... Christianity is mission-centered because God extends his rule through his gospel word... The gospel is a word; so the church must be word-centered. The gospel is a missionary word; so the church must be mission-centered (24, 28). In this way, Chester and Timmis argue that the gospel defines who the church is and what it must do. The gospel word defines the extent ("when [church leaders] apply the word they are exercising the authority of God himself") and limits ("they have authority only as the teach God's word") of the church's authority (28). And the gospel makes the church into a missionary people (the "missional cardiogram" questions on page 33 are fantastic!). Community. The gospel gives the church its' community identity. God has saved a people for himself--a community of people, not just individuals. Church is not simply another responsibility for individuals to juggle--along with family, friendships, career, leisure, chores, decisions and money (44). Instead, the church, that is the community of Christian persons, should be at the center or hub of life. "[It] defines who I am and gives Christlike shape to my life” (43). Chester and Timmis recognize the radical nature of this proposition. They speak the gospel's message of community reconciliation, unity, and identiy as God's people into Western culture, with its "pervasively individualistic worldview" (41). They suggest, "This is perhaps the most significant "culture gap" that the church has to bridge. But the church community itself provides the church with its strongest apologetic--being with the church's people should be the most attractive thing about church(49). After all, as Chester and Timmis state later in the book, "Jesus gives the world the right to judge the sincerity of our profession on the basis of our love for each other” (65). Part 2, Gospel and Community in Practice. Chester and Timmis then use the rest of their book to answer the “so what?” question. What does it look like for a church to be centered around the gospel and community? Each of the remaining chapters answers the key question: How should our understanding and practice be reshaped around gospel and community? Here is a quick run-through of selected chapters. I've highlighted some of the most powerful quotes, and I've offered very brief critique. Chapter 3, Evangelism--Gospel and community are central in evangelism. "The word creates and nourishes the community, while the community proclaims and embodies the word" (55). "Jesus gives the world the right to judge the sincerity of our profession on the basis of our love for each other” (65). Chapter 4, Social Involvement--The gospel calls us into community with the poor. "In the culture of first century Palestine, eating was an indication of association and friendship. Indeed, eating continues to function in this way in most cultures of the world. Inviting someone to your home for a meal and accepting such an invitation are both signs of communal bonds" (70). "Jesus' eating with sinners is a wonderful declaration of the riches of God's grace. But notice how this grace plays out in practice. It results in Jesus spending time with the despised and marginalized. It means Jesus has time for the needy. They are his priority" (73). In our ministry to the poor, gospel word and gospel mission (deeds) are inseparable. "Luke's gospel, which has the most to say about the poor and the inclusion of the marginalized within the Christian community, is also the Gospel that has the most to say about the centrality and sufficiency of God's word" (77). "Part of our evangelism to the rich is our evangelism to the needy. We subvert their preoccupation with power and success as they see us loving the unlovely" (73). Chapter 5, Chruch Planting-- "Church planting puts mission at the heart of the church and the church at the heart of mission" (85). This vision shapes our theology and our church structures. "Mission can no longer be looked at as one branch of theology. All theology must be missionary in its orientation. We need the same reorientation as churches. We are in a a missionary situation and all that we do must be missionary" (86). "As they grew, the apostolic churches became networks of small communities rather than one large group, to safeguard apostolic principles of church life" (93). I would offer some mild critique here. Chester and Timmis really emphasize smaller gatherings and put a lot of weight on the New Testament term "household" (91-94). While house churches were certainly normative, both Jesus and the apostles also gave attention to preaching in larger gatherings--not only the hall of Tyrannus (Acts 20:20) as the authors' note (92) but also the Jewish synagogues (Matthew 4:23; 9:35; Acts 13:5, 14; etc.). Chapter 7, Discipleship and Training--The gospel remains central to all Chrisitan discipleship. "We continue to "evangelize" one another as Christians because it continues to be the gospel message with which we exhort and encourage one another" (111-112). "All too often people equate being word-centered with being sermon-centered. People argue for sermons by arguing for teh centrality of God's word, assuming that word and the sermon are synonymous in Christian practice... Our contention is that being word-centered is so much more than being sermon-centered" (114). "We have found in our context that most learning and training takes place not through programmed teaching or training courses but in unplanned conversations--talking about life, talking about ministry, talking about problems" (118). I totally agree, but gospel ministry in all of life should not detract from preaching itself. After all, Paul's primary instruction to Timothy was to "preach the Word" (2 Timothy 4:1-2). In this context, preaching can't be limited to "discussion, dialogue, or debate" with unbelievers. Rather, Paul clearly defines it as "correcting, rebuking, and encouraging"--activity that seems to be primarily directed toward the church community. While Chester and Timmis' emphasis on discussion, dialogue, and debate with unbelievers is welcome, their exegetical argument (particularly the interpretation of Acts 20:7 on page 114) seems a bit strained--and much too limiting. Chapter 8, Pastoral Care--Chester and Timmis advocate a biblical approach to care that upholds a strong belief in the sufficiency of Scripture to address all issues in life. "The term spiritual is not simply another category alongside biological, physical, environmental, upbringing, or relationships. Each of those forms of suffering, passive or active, is always and at some point a spiritual and theological issue" (135). Chapter 10, Theology--"Restoring biblical theology to its true home in the believing, missionary community is at once a far more accessible and a far more demanding enterprise. It demands of us that our Bible teachign should always look to explore the missionary implications of a passage--to make the truth plain and to make it real" (157). Total Church is a though-provoking book that I highly recommend. But what does all of this have to do with children's ministry. The answer is "everything." Chester and Timmis dedicate chapter 12 of their book to "Children and Young People." In a future post, I'll take time to look through that chapter with more care. Susan Hunt. Sammy and His Shepherd: Seeing Jesus in Psalm 23. Illustrated by Cory Godbey. (Lake Mary, FL: Reformation Trust Publishing, 2008. 56pp. $17.00 Susan Hunt is a consultant for the Presbyterian Church in America's Women in the Church ministry, which she formerly directed. She has written on women's ministry (Women's Ministry in the Local Church with J. Ligon Duncan) and children's ministry (Heirs of the Covenant). She has written numerous books for children as well including Big Truths for Little Kids and My ABC Bible Verses. Hunt is also one of the primary writers behind the Show Me Jesus! curriculum that we use for our SojournKids Sunday Bible classes. In her newest children's book, Hunt provides a line by line exposition of Psalm 23--told from the perspective of a sheep named Sammy. Sammy lives happily under the care of his faithful shepherd, and by listening to his tale, we learn about what it means to trust and walk with our own Good Shepherd. Several things are evident immediately when reading through Sammy's story. "Sometimes a sheep like you can roll over on his back," the shepherd said. "When that happens, we say the sheep is cast down. A cast-down sheep cannot turn himself back over. If someone doesn't help the sheep, he will die. He needs someone to restore him to a right position" (20). In this way, Hunt weaves nurturing biblical counsel into Sammy's story. Sammy shares with us what it means to be known by the shepherd, to be called by name, to be fed with spiritual truth, to be restored when we are cast down, to have our fears calmed so that we can rest, to be disciplined when we stray, and to be protected from our enemies. Hunt also uses Sammy's friendship with "my friend," a sheep from another flock as a sort of anti-Psalm to remind us what it is like not to have a shepherd like Sammy's. Second, Hunt is an experienced Christian educator. She presents the material so that it is ready to be taught immediately. An appended "Talk About It" section at the end of the book provides memory verses, discussion questions, and applciation points for parents to use with young children. Using the "Talk About It" sections, the book can easily be read chapter by chapter as an eleven-night family devotional. Of course, Jesus was not talking about water like you drink out of a glass. He was talking about spiritual water. He was talking about Himself... Every morning, ask Jesus to help you to be thirsty for the Water of Life--Him (47). I am so thankful for a devotional (and curriculum) writer who is committed first and foremost to the gospel of God. This story encouraged me to delight in our Good Shepherd Jesus, and I pray it encourages my children to do the same. Finally, Cory Godbey should be commended for excellent illustrations that do exactly what picture book illustrations should do--help tell the story without detracting from it. I highly recommend this book. Rachael is getting it for her birthday next week. I trust that it will be as encouraging to our family as it was to me personally. Check out other reviews of Sammy and His Shepherd by Justin Taylor and Ray Van Neste. This is the linchpin in every argument I have made or will make in this book. God has designed your family--not the youth group, not the children's ministry, not the Christian school, but your family--as the principal agent in your children's lives. The most important job you have as a parent is to train and disciple your children (118). Parents must make worshiping the true God a priority by personally repenting from the idols of self-fulfillment and success (Ch. 2, "A God With No Rivals"). Parents must cultivate a biblical rather than a romantic understanding of love (Ch. 3, "Learn To Love"). Parents must teach their children a biblical worldview (Ch. 4, "Give Him Your Heart"). Parents must teach the Bible to their children at home (Ch. 5, "Teach the Word at Home"). Parents must implement biblical discipline that is both corrective and formative (Ch. 6, "Live the Word at Home"). Parents must practice regular family worship (Ch. 7, "Mark the Home as God's Territory"). Parents must make family time a higher priority than wealth and personal success (Ch. 8, "Enjoy the Gifts without Forgetting the Giver"). There is much to be gleaned from Baucham's approach. His biblically-based focus on the home is welcome. His unapologetic advocacy for biblical marriage, biblical families, and biblical church leadership is right on target. The practical suggestions given for cultivating marriage (Ch. 3), teaching the Bible to children (Ch. 5), and catechizing (Ch. 6) are particularly helpful. I am personally thankful for them, and I highly recommend these chapters. Baucham is right. Certainly the home (not the Sunday school or public church gathering) is the front line of ministry to children and youth. On the other hand, there seems to be a subtle danger in Family Driven Faith--a danger that first appears in the book's title. To put it simply, I would suggest that the next generation does not need a family-driven faith so much as it needs the faith-driven family. Pastor Mark Driscoll has suggested provocatively that it is "sometimes a sin to focus on the family." It is particularly dangerous if our message about biblical families begins to eclipse the gospel. It is possible, after all, to keep the commandments from one's youth and still lack that one thing--a personal faith in Jesus that results in repentance (Mark 10:20-21). It is even possible to teach the Scriptures, catechize, and practice biblical parenting principles without knowing the Savior. The statistics quoted at the beginning of this review are so daunting. Nearly 8 of 10 students leave the church by their second year in college. Baucham admits that the majority of these kids did not embrace the gospel in the first place. The problem is not that these children are leaving Christianity. The problem is that most of them, by their own admission, are not Christian! Hence their leaving makes complete sense... Thousands, if not millions, of people have been manipulated into 'repeat after me' prayers and 'if you ever want to see that dearly departed loved one again...' altar calls without a trace of the Spirit's regenerating power (12). The church is not a family of families. The church is the family of God (1 Peter 4:17; 1 Timothy 3:15). This means it's a family of believers who have been grafted into Christ and so adopted into God's family (see John 15; Ephesians 1:4-6; 2:19; Galatians 4:1-7). It may seem like a small point, but the shift of emphasis makes a difference (HT: 9 Marks See Baucham's response). The church's identity is formed by the gospel. We must be careful not to put anything else at the center--even a biblically informed understanding of family life. It will be powerless apart from the word of the cross. We should not expect a renewed emphasis on biblical manhood and womanhood, marriage, parenting, and family worship to bear any fruit unless the gospel of Christ crucified and risen for sinners drives this message. "If righteousness could be gained through the law, Christ died for nothing!" (Galatians 2:21). Young People in Church Life: Abandon Age-Segregation? While I believe the vast majority of those who shepherd segregated congregations are well meaning and would never presume to replace parents in their biblical role, I believe the modern American practice of systematic age segregation goes beyond the biblical mandate (178). Our church has no youth ministers, children's ministers, or nursery. We do not divide families into component parts. We do not separate the mature women from the young teenage girls who need their guidance. We do not separate the toddler from his parents during worship. In fact, we don't even do it in Bible study. We see the church as a family of families (191). 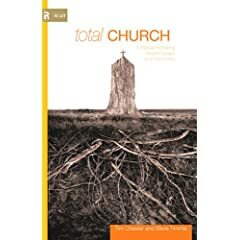 Our experience suggests that more significant than peer relationships are relationships with Christians who are older than the teenagers, but not as old as their parents--adults who may not be 'youth workers', but who are committed to young people just as they are committed to other people in the church and who model gospel living and make young people feel part of the Christian community (Total Church, 181). Part of the discipleship of young people is encouraging and equipping them to be willing participants in diverse congregations (Total Church, 182). Baucham argues that there is no clear biblical mandate for the current age-segregated approach. I would argue that it is hard to find the biblical mandate for family-integrated public gatherings as well. I am aware that some passages in the epistles address children directly (e.g. Ephesians 6:1-3) implying that kids were present in the public gatherings where the NT letters were read aloud. But this does not mean families sat together. After all, in first-century synagogues, men and women sat in separate sections. Age-segregation is culturally accommodating, but it is unrealistic and wrong to think that all cultural accommodation can and should be avoided. I am convinced that age-segregation has its dangers--the chief of which is accentuating a cultural gap between generations in a church community--but it also has its advantages--chiefly the pedagogical advantage of age-directed lessons. [Some] churches encourage children to remain in the meeting throughout, expecting them to behave like little adults. Children trained in this way from an early age may pull it off... It is completely unrealistic to expect this for unchurched families whose family life may be too chaotic to conform to this pattern. If your church manages to keep children quiet during sermons then it is probably because you are failing to bridge other social divides! (Total Church, 183). We must not knowingly set up such social barriers to the gospel (Galatians 3:11ff). We cannot continue to send our children to Caesar for their education and be surprised when they come home as Romans. More importantly, we cannot continue to use Caesar's methods in our Christian schools and expect a different outcome. Education is inseparable from discipleship (200). I agree with Baucham that homeschooling and private Christian education often has its advantages. However, I am not comfortable making such sweeping statements. Our convictions about education or ministry programs should not be held so tightly that they keep us from sitting at the same table and celebrating the gospel with a family or church leader whose context and conscience have led them to differing conclusions. The "new tribe" of Christianity both creates its own culture and actively engages the cultures of this world. The gospel leads the Christian to contextualize his message (1 Corinthians 9:19-23) and avoid the extremes of both culture war and full-scale cultural accomodation. Listen to Gary Shavey's audio interview with Dr. Bauchum at the Resurgence.